Are you part of a netball, football or rugby team? If so, we have a very exciting opportunity and we would love to hear from you! This month the Kids Club Kampala football league officially kicks off in Kampala, with our first match taking place this Saturday. We currently have 32 football teams across our 18 KCK centres and they will all be competing fiercely throughout the coming months to win the KCK league cup! We have been running our football programme for several years now, and we have been receiving numerous requests from groups of girls for proper coaching in netball. Netball is a very popular sport amongst girls in Uganda, and it gives young girls the chance to develop their skills and talents in a sport they love. We also have a group of children from our KCK Mutundwe centre who have been learning how to play Tag Rugby too, however our biggest challenge in running all of these sports activities is funding. If you are part of a netball, football or rugby team we would love to hear from you! Would you be interested in twinning your team with a team in Uganda? For just £50 a month your Club could provide much needed coaching, kits, and balls and enable a sports team in Uganda to play in matches around Kampala. 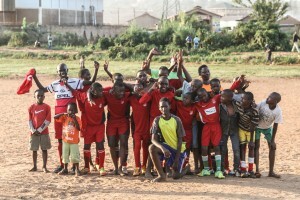 You can even come out to Uganda and help coach a team yourself!